My commitments to our Environment that I will continue to live by and champion in Congress. Like many New Mexicans, I enjoy spending time outdoors and understand how important New Mexico’s natural beauty and resources are. I’m concerned that if we don’t do more to protect our open spaces and reduce climate change, there will be devastating and lasting impacts on us and future generations. I learned from my parents to revere nature. Their way of teaching us to respect the environment was to be in it, and so we spent a great deal of time outdoors. I fondly remember a family vacation at Dismal Swamp - rowing a boat up and down the swamp fishing for several days, and once while at the beach in Virginia, my sister and I floated at least a mile out on the Chesapeake Bay on dime store blow up rafts. The Marine lifeguards had to swim out to rescue us. I was never scared, because the beach was a familiar place. In June this year, former United Nations climate chief Christiana Figueres, along with other prominent diplomats and scientists, wrote an open letter about the future of our environment. In their estimation, the world has three years before the worst effects of climate change take hold. I’m going to spend those three years working to become and serve as your next Congresswoman and do whatever I can to push bold action on climate change and our environment. I went to Standing Rock because I believe the health of our earth and environment are the most important factors for the future of our children and grandchildren and their ability to thrive, and I saw the #NoDAPL protest as a drum beat for true environmental change. Dependence on finite and scarce resources -- like oil -- hurts workers, the middle class, and our economy by continuing to drive profits to the few. Ignoring climate change sets up our students and workforce for failure by not educating them about the needs of the future. Everything depends on our ability to sustainably inhabit this earth and true sustainability will require us all to change our way of thinking on how we take from the earth and how we can give back. In Congress, I’ll work to protect New Mexico from irresponsible development that could change our state forever, harm public health and hurt our economy in the long run. I will fight the sale of public lands to private interests, expand the use of renewable energy, protect our air and water, and work for sensible development. I will not ignore the hard facts of climate change, and I will fight to regulate our biggest polluters and ensure accountability. Climate change is real, and poses a real threat to our way of life. We cannot ignore the endless amounts of data, the scientific community at large, and what we are witnessing when it comes to our earth’s response to carbon and other greenhouse gas pollution. Ice caps and permafrost are melting, and weather patterns are changing and becoming more violent; these are not opinions -- these are the facts. We need to keep and advance our global and national commitments to reducing carbon pollution, and ensure we have a well funded EPA to oversee regulatory requirements -- including leadership, management and staff who know climate change is real and that we must act boldly and swiftly. Corporations that pollute must be regulated, and there must be real consequences for violations. Taxpayers should not be paying to clean up their mess. Climate change is a national security threat and it should be treated as such. Just take a look what is happening in Florida, Houston and Puerto Rico. National defense spending must also include defense of our environment. We have world-renowned scientists and labs including right here in NM-01 with Sandia Labs, and they should be funded to explore and produce solutions for safe and sustainable environmental practices. Without a sustainable planet to inhabit, national defense has no purpose. In Congress, I will not ignore the hard facts of climate change, and I will fight for the hard facts of science to inform environmental policy and how we use taxpayer dollars. I will also fight to regulate our biggest polluters and ensure accountability. Clean Energy will save our planet -- and our economy. We cannot rely on finite energy resources, the extraction of which wreaks havoc on the air our children breathe and water they drink. New Mexico’s economy would be so much stronger if we would fully capitalize on our solar, wind, and geothermal energy sources. I will work to make New Mexico the clean energy leader in the nation, which will also make our economy more secure with sustainable, good-paying jobs. I will champion efforts in Congress that make it easier to transition to clean energy, and provide incentives for individuals, businesses, and states that make the transition. I will advocate for robust training programs to build a qualified workforce for the clean energy industry, and to ensure we don’t leave oil and coal workers or anybody behind. Water is life. We must ensure the availability and integrity of this resource for generations to come. Fracking is a danger to the air we breathe and water we drink. Fracking, as it is currently used, pollutes our nation’s water supplies and primarily impacts rural and low income communities. In the case of New Mexico, these communities are also largely Native American. The auctioning off of our land for fracking and drilling serves only to drive profits to the few. 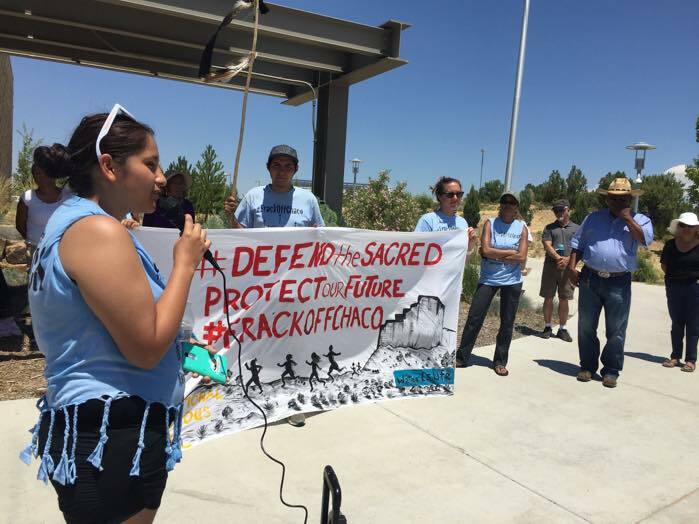 We must not destroy protected Native ancestral lands and important cultural and heritage sites for the sake of a relatively short-term oil and gas fix, especially when it results in the degradation of sacred sites, land, water, and air. I will fight special interests in Washington who exploit Native, rural, and low income communities for the purpose of fracking and drilling that pollutes our environment. No short or long term gain is worth polluting our water. Water is life. Climate change has had a devastating impact on the sustainability of freshwater. As temperatures increase, industries like manufacturing and agriculture have to use more water to sustain their operations. Fighting climate change is water conservation. Water conservation should be part of incentives for household energy efficiency and corporate reduction of carbon emissions; and, we need to promote strategies for water conservation like harvesting rainwater and protecting and utilizing groundwater resources. Strategies like these at scale would mitigate high water consumption industries, like agriculture, while also preserving their livelihoods. We're had too many lessons from which to learn -- offshore drilling is dangerous to our oceans, sea life, and shore-based economies. Offshore drilling is not the solution to U.S. energy independence, and I am against opening parts of the Arctic, Pacific and Atlantic oceans to oil and natural gas production. We must learn from our past -- disasters like Exxon and BP -- and forge a new path for energy independence that does not rely on finite resources, or risk the health of our oceans that maintain a critical balance for our ecosystem. Big Oil’s bottom line depends on the American people believing and consuming as if we have no other options. We do have solutions -- in solar, wind, geothermal, and wave energy -- and we can have clean energy independence. Methane pollution has cost New Mexico taxpayers millions and is a major part of the climate change problem -- we must ensure the Methane and Waste Prevention Rule remains intact. Methane is a greenhouse gas that is 25 times more potent than carbon dioxide. I support the Obama Administration’s goal to cut methane emissions from the oil and gas sector by up to 45% from 2012 levels by 2025. The Methane Waste and Prevention Rule alone projects cutting these emissions by up to 35%. In addition, states, tribes, and taxpayers are losing millions from the amount of wasted natural gas. Producers should be required to use the latest technology that reduces waste in order to ensure a fair return on investment. Public lands are there for all of us -- not for a few at the top to make a profit. I support protecting and expanding our public lands. They are our heritage, and they support recreation economies that create revenue and jobs. Public lands also help preserve ancient histories of people who came before us -- people who better understood the importance of honoring our land, water, and air. I’ve stood up to Trump and Interior Secretary Zinke and their plans to shrink national monuments and auction off land for extraction and profits. In Congress, I will keep up the fight for what rightfully belongs to the people. The number of animal species on this earth provide a critical balance to our ecosystem, we must respect that role and fight their exploitation by special interests for profit. We must preserve the natural habitats of animals. We need broad protection for marine animals. Land and water conservation helps protect fish and wildlife by maintaining and growing their natural environments. We must also stop the multi-billion dollar industry that is wildlife trafficking. This industry thrives on corruption, funds terrorism, and results in the extinction or near extinction of animals. We need tougher penalties for poachers and traffickers; we also need to work with under-resourced countries on anti-trafficking efforts. Our environment and our health need clean food and green farming. Our environment is impacted by how we grow and produce our food, and our environment impacts the food we eat and water we drink -- which means it impacts our health. Factory farms are not sustainable for our environment or our health. They emit dangerous greenhouse gases, causing immediate harm to the air we breathe and expediting climate change. They also often engage in torturous practices on animals for the sake of expediency. We need a new direction when it comes to agricultural practices -- one that prioritizes a shift to sustainable and organic farming, creates opportunities to transition from factory to green farms, and incentivizes states, local jurisdictions, and taxpayers to make the transition. Small local farms and ranches should be made viable players for USDA grants, which would help to grow economies where it can do some good; grants shouldn’t just be awarded for the large corporate farming operations. Whether it’s the wild rice lakes on the White Earth Reservation in Minnesota, water at Standing Rock or in Flint, Michigan, by and large, communities of color and low income communities are most impacted by environmental harms. Coal plants and nuclear waste facilities are built in areas where developers expect little political will or power, and the carrot of jobs is usually dangled to sweeten the deal. This level of manipulation -- making underserved and underrepresented Americans choose between clean water or putting food on the table -- is injustice at work. In Congress, I will be a voice for communities that are targeted for industries dangerous to our environment, and work for remediation in those areas where the damage has been done -- environmentally and economically. We all deserve clean air, water, and land. I will fight the notion that our earth is simply a commodity to be bought and sold to the highest bidder. For many decades I have worked to contain my own personal carbon footprint. I take many steps in my daily life to walk the talk. By remaining true to good environmental practices I can reduce my own carbon footprint significantly. Calculating all I do in the furtherance of our environment, I save more than 10,000 pounds of carbon from going into the atmosphere every year. I will fight the short-sighted politics of extracting natural resources without a thought to our future. I will promote conservation and clean energy solutions that help our earth heal, and help sustain it for generations to come so that our children and grandchildren can thrive. I will be the champion for our environment that New Mexico and our nation needs and deserves -- and I invite you to join me.